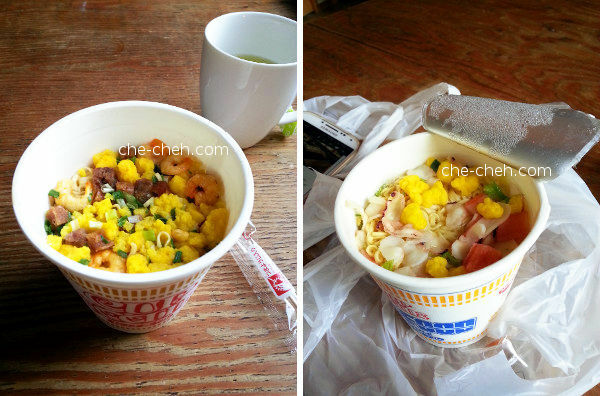 Had pork and seafood Cup Noodles from Nissin for breakfast on day 6. Cost 184 yen each from Daily Yamazaki. 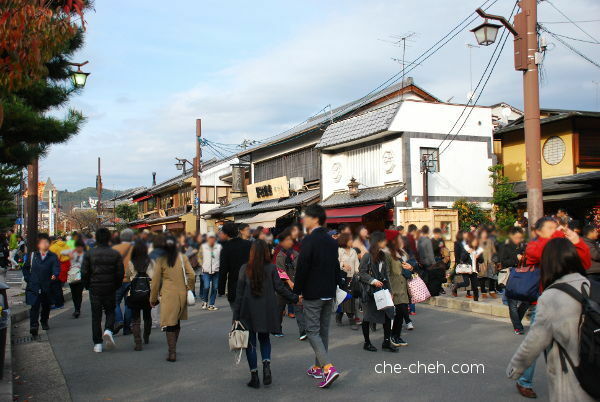 The day before (day 5) were spent at Higashiyama (Eastern part of Kyoto) area. You can read our day 5 adventure at the links on top. 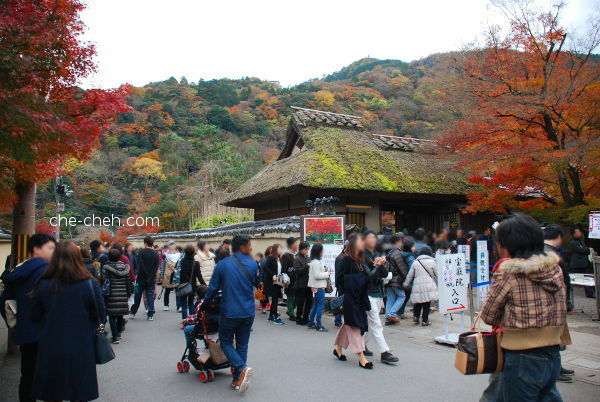 And today, day 6 is going to be at the Western part of Kyoto called Arashiyama. From our hostel (Lens Kyoto) around 9.30am, we walked to Kawaramachi Station and took the Hankyu-Kyoto line to Katsura Station. 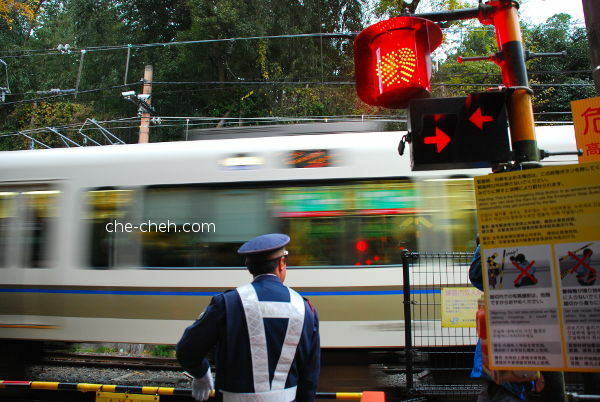 Then we changed line to Hankyu-Arashiyama line and ride until the end of the line which is the Arashiyama Station. 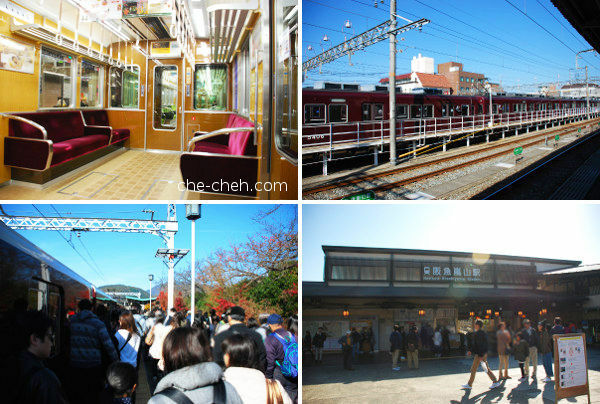 Top left: antique looking train on the Hankyu-Kyoto line. 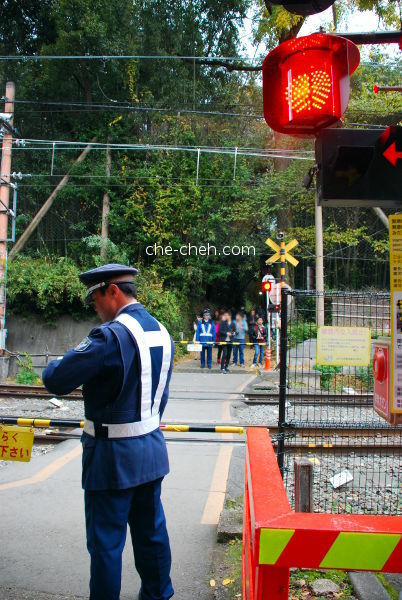 Top right: at Katsura Station (on Hankyu-Arashiyama line) waiting for train. 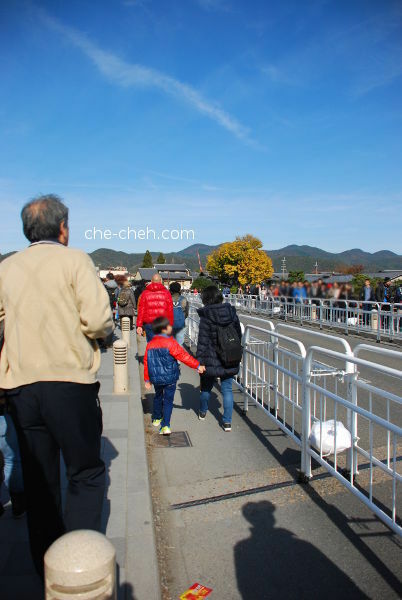 Bottom left: major people jam at Arashiyama Station! Bottom right: outside of Arashiyama Station. 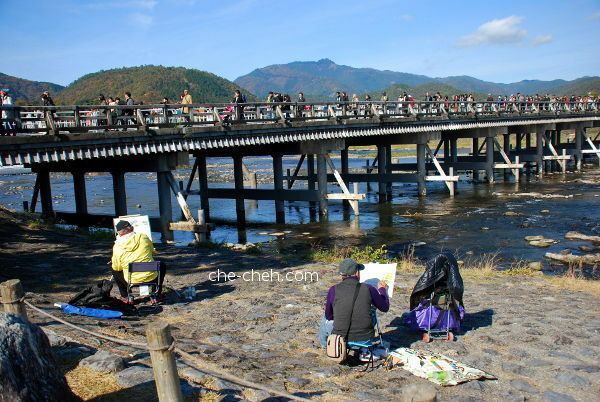 From Arashiyama Station, we walked to Togetsukyō (bridge) while absorbing all the beautiful surrounding. 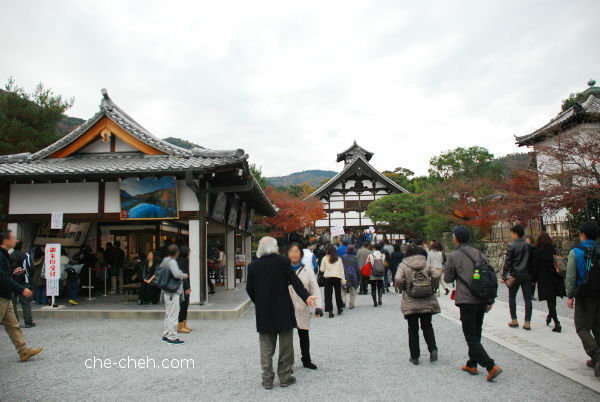 We encountered the most tourist in Arashiyama than other parts of Kyoto throughout our stay here. Perhaps because it was a Saturday. 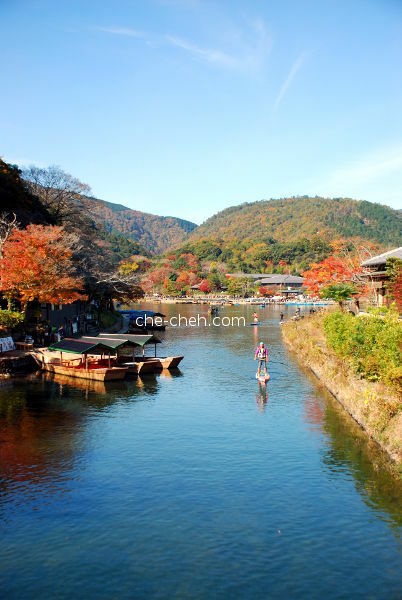 Stand up paddle boarding at Hozu River in autumn. Taken from Togetsukyō (bridge). Background is the Arashi mountain 嵐山 aka Arashiyama aka Storm Mountain. This is the famous part of Togetsukyō 渡月橋 (bridge). So many people coming and going over. The river that flows here has two names. On the left side of the bridge, the river is called Hozu River 保津川 and on the right side it’s called Katsura River 桂川. Oh yes, it was a pleasant day to sit down and paint. 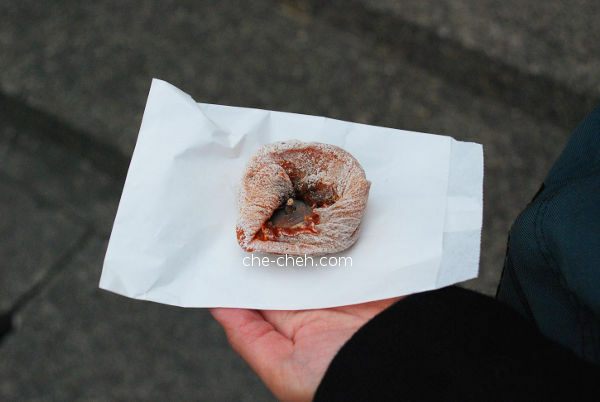 At the Katsura river bank, there are several stalls selling yummy snacks. We bought grilled squid @ 400 yen. Yum-yum. Saw a golden and I immediately thought of Chester. We sat there for quite sometime, enjoying the blue sky and pleasant weather, looking at kids playing, the swimming ducks and the birds showing off their V-formation. 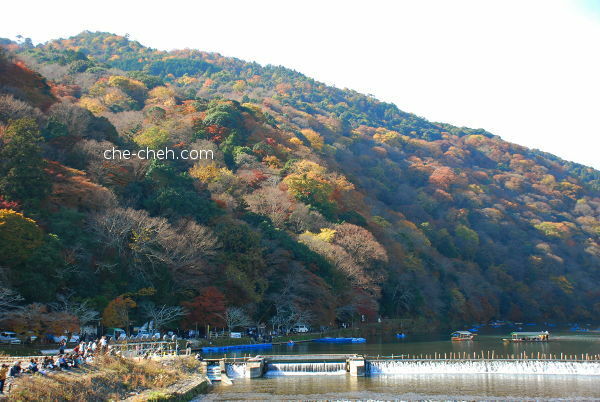 Arashiyama 嵐山 bathed in fall colors. It wasn’t as vivid as I hoped it would be but stunning nevertheless. I can imagine sitting there and spend the whole day painting with the mountain as my subject. On Togetsukyō (bridge), crossing to the other side. Right after the bridge, there’s a T-junction and my gosh the amount of people there can rival that of at Shibuya crossing. It was so packed that you have no space to stand at the 5-foot way. Thankfully there are authorities there to take care of traffic. Beautiful pine and ginkgo trees. We’re heading to our lunch place at Yoshiya Oku No Niwa 良彌 奥の庭 that serves tofu meal. It was one of my best meal in Japan! Click the link to read all about it. 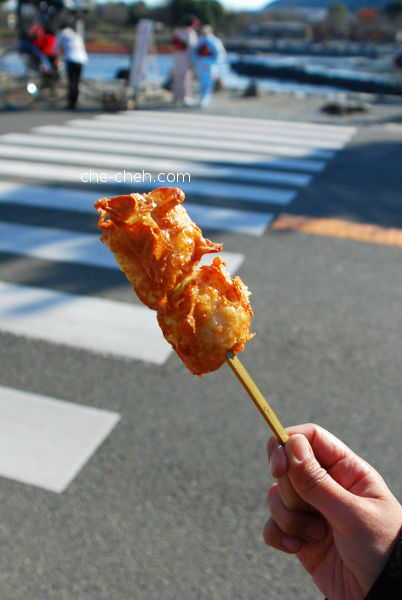 After lunch, we had this delicious deep-fried yuba cheese @ 300 yen (also from Yoshiya). Yuba is tofu skin/beancurd skin. 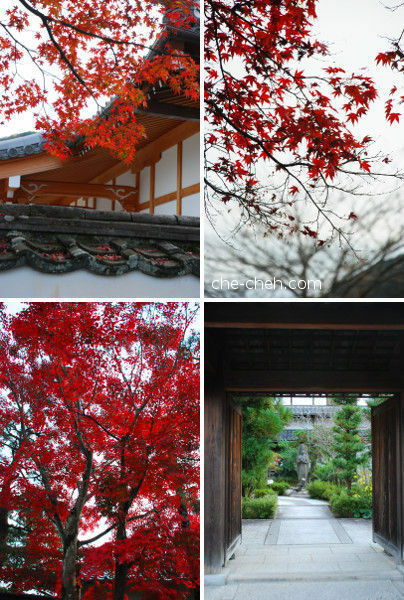 Saw lots of maple trees around Tenryū-ji and Hogon-in Temple. Passed by this place which I didn’t know is a temple initially. It’s called Hogon-in Temple 宝厳院 and is a sub of Tenryū-ji. 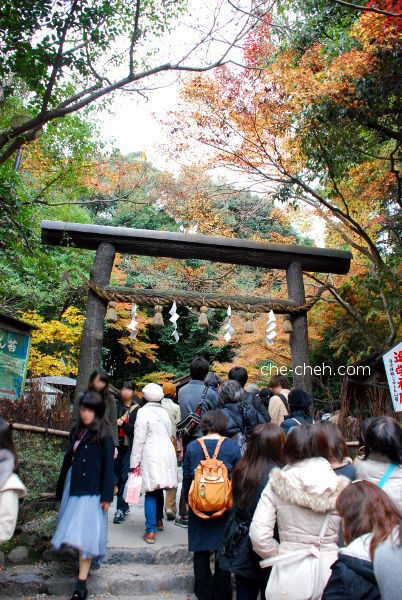 There were all there for momijigari (autumn viewing) because of its stunning fall foliage. I peeked but didn’t enter because I guess I’ve seen enough at Kiyomizu-dera and Kōdai-ji. There’s a entrance fee of 500 yen. 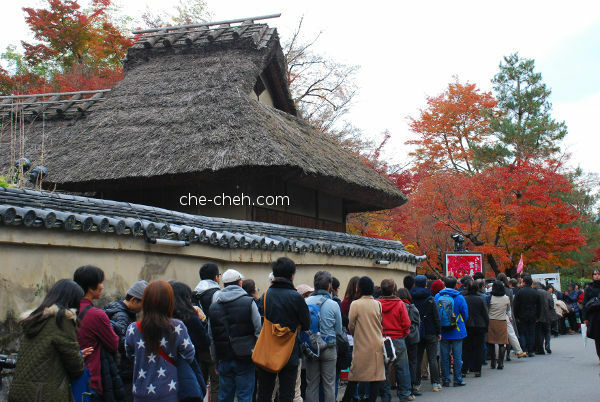 How popular is Hogon-in Temple for koyo viewing? Judge the long line! Walking towards the end of the road passing by Hogon-in Temple, brought us back to Hozu River (the other side from when we initially arrived). 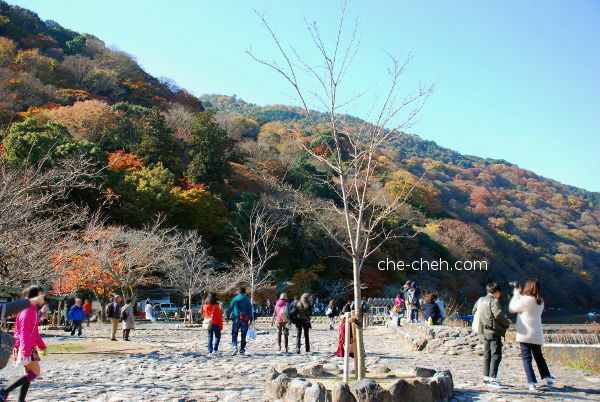 What a stunning view of autumn at Arashiyama. At the outside of Tenryū-ji 天龍寺. Didn’t went in because I decided to skip this. A break for ice-cream is always welcome, what more this is matcha tofu soft serve ice-cream, a flavor you can’t find outside of Japan easily. Cost 300 yen from the famous Saga Tofu Ine restaurant. 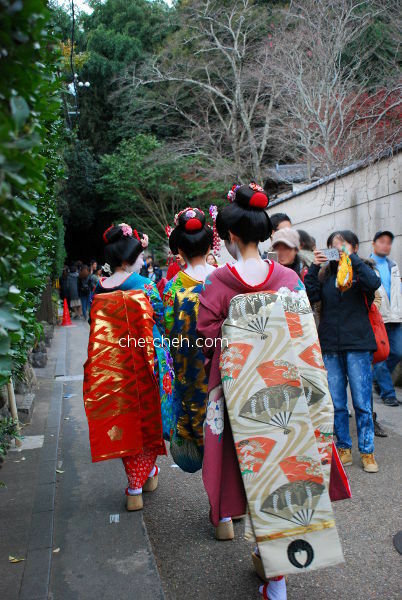 We met three ‘models’ dressed as maiko on the way to Sagano Bamboo Forest 嵯峨野 竹林の道. I guessed they are models because there’s a photographer following them and their dressing doesn’t conform to the real maiko rules. We sort of tailed them for quite sometime as we’re headed to the same direction. I’m pretty sure you’ve seen lots of stunning shots of this bamboo forest in the internet. I also dreamed of snapping a few good ones but unfortunately this is the best I can get. What a disappointment. My reason: lighting. It was quite dark here and the time was around 3.30pm-4pm. There were only few instances when we get some strong natural light. No doubt there are many people here but the space were still breathable. And I love listening to the bamboo leaves rustling at each other. So soothing! FYI, Kōdai-ji has a bamboo groove pathway too. The pathway is short but the bamboos are taller if my sense of perspective is correct. We saw a shrine called Nonomiya Shrine 野宮神社 in the bamboo forest. Again the line was long. We didn’t went in. After crossing over to the other side of the bamboo forest, we walked around a bit and turned back. Then I met this super cute and fluffy akita. I asked the owner whether I can touch him and he said okay. Ahhh… and we walked together until back at the entrance of the bamboo forest. 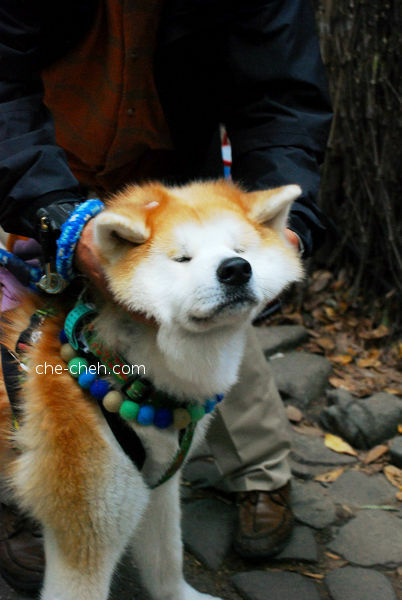 What are the chances of having maiko and akita accompanying me into and out of the bamboo grooves? Really rare I would say. Their presence made this experience more worthwhile especially the doggie! It’s like a sign telling me to get a new dog to join the family (I also met a golden earlier, remember?). 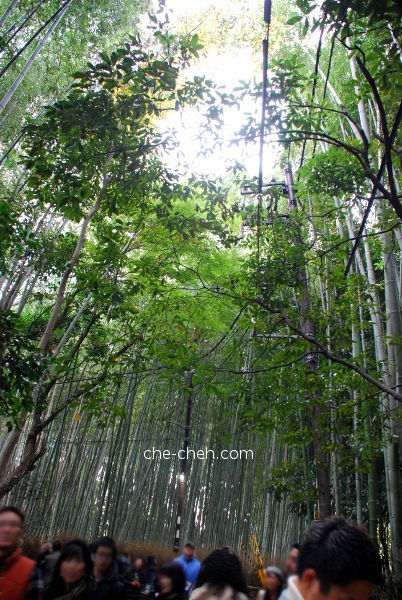 In total, we spent around 25 minutes in the bamboo forest and we didn’t even walk the whole area. Time was 4.11pm and it was time to head back. Bought dried persimmon to try. Delish. Cost 100 yen. 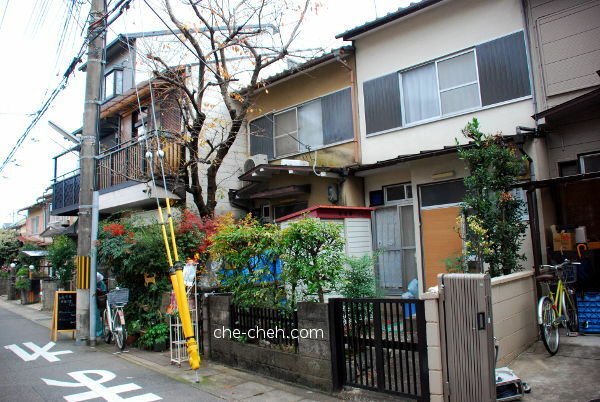 Walked pass these Japanese houses on the way to JR Saga-Arashiyama Station. We didn’t went back hostel right away. We decided to have dinner before going back hostel because we knew we’ll be too tired to come out after that. But before that, we detoured to two places first because they are closing for the day real soon. Posting letters home at Kyoto Central Post Office. 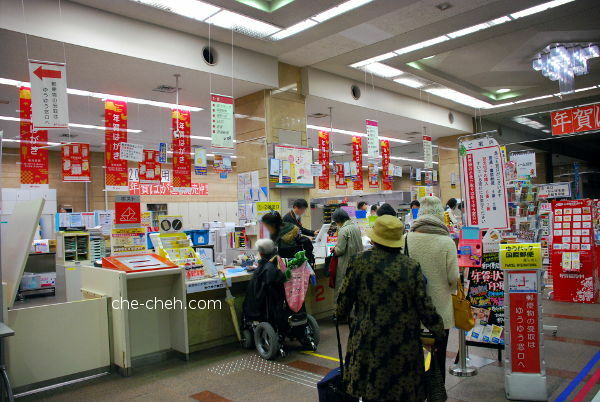 This post office is beside Kyoto Station where we’re going to have dinner there. The best part about this post office is that it’s open 7 days a week from 9am-9pm (weekday) and 9am-7pm (weekly). 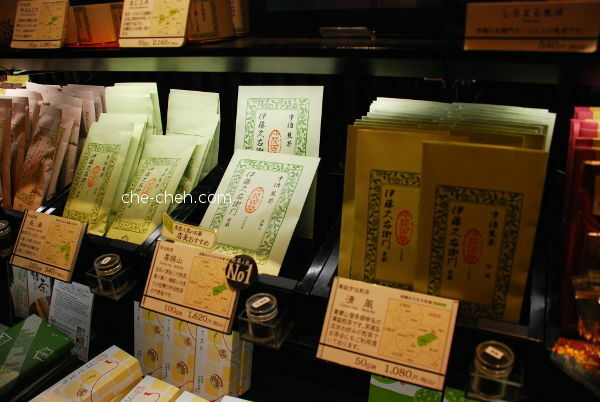 Then we stopped by Itoh-Kyuemon (Kyoto Station front store) 伊藤久右衛門 京都駅前店 where they sell everything tea. They’re from Uji, Kyoto and what’s famous in Uji? You got that right, green tea. We actually took a really long time trying to locate Itoh-Kyuemon. We knew it’s opposite Kyoto Station but somehow we couldn’t find it. We even asked a mobile store executive for help. With her mobile search and ours, still no luck. LOL. Just when we were going to give up, suddenly we saw Itoh-Kyuemon. 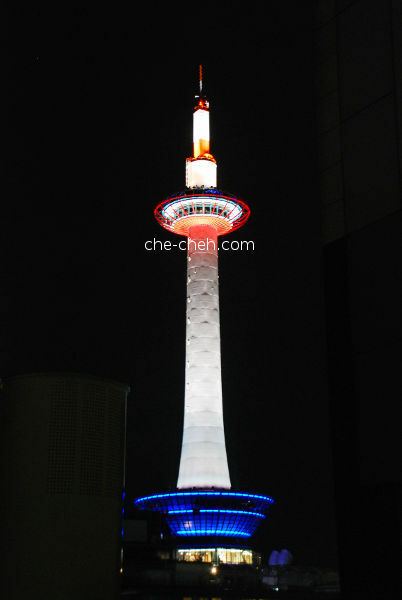 It’s actually located at the Kyoto Tower side (east) and all this while we’ve been searching at the west area. So many types of tea. We bought the usual suspect and also couple of rare items like Uji matcha sake and Uji matcha soba. After that we went to Kyoto Ramen Koji in Kyoto Station for dinner. 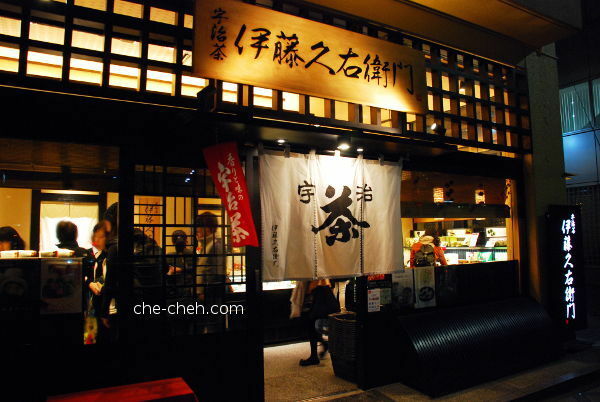 Kyoto Ramen Koji is a place where you can sample ramen from different regions all in one place. We ate one that was really fatty and salty! Click the link to read more. 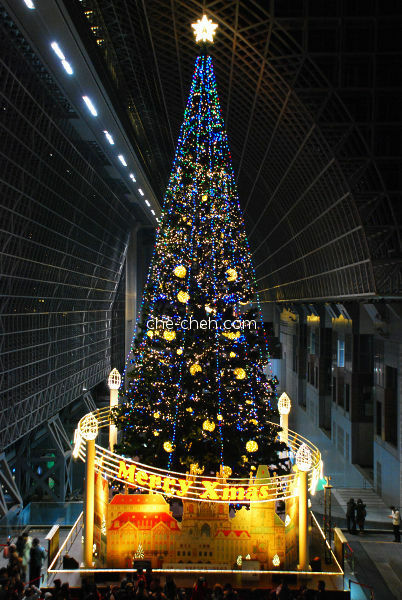 A very tall Christmas tree 🎄 in Kyoto Station. The Kyoto Station building itself is stunning. Wish I have more time to explore. The Christmas tree and its reflection. 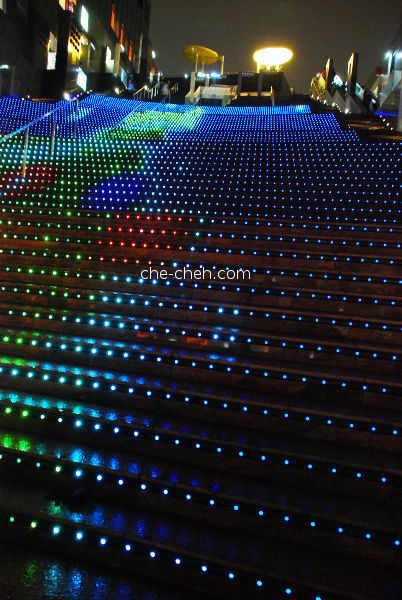 Graphical illumination at the grand staircase of Kyoto Station. This area is open air and it was drizzling when we were there. Kyoto Tower taken from Kyoto Station. The tower is just across the street. 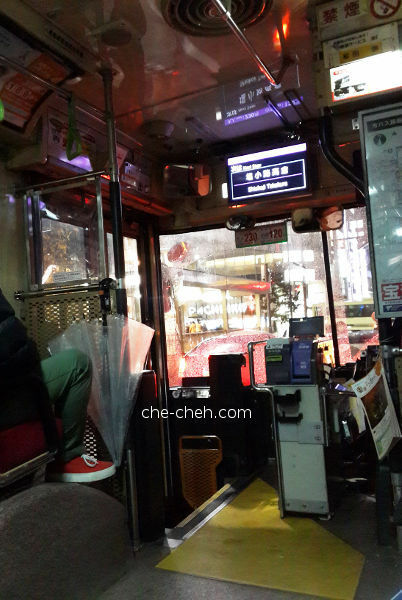 We rode bus back to our hostel and paid with ICOCA card. Another experience ticked off! Yes, ICOCA card can be used for Kyoto’s rail/subway too. We dropped by 7-11 to get our breakfast and found out that 7-11 is actually cheaper than Daily Yamazaki. 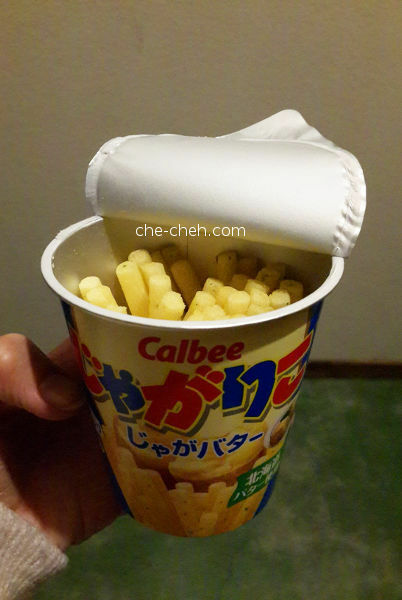 Tried this famous Calbee Jagariko @ 99 yen which we bought on day 4. It’s potato sticks with butter flavor. Not bad at all. It’s too little to be shared though. We slept around 1am with rain drops as our lullaby. That’s all for day 6. Stay tuned for day 7. 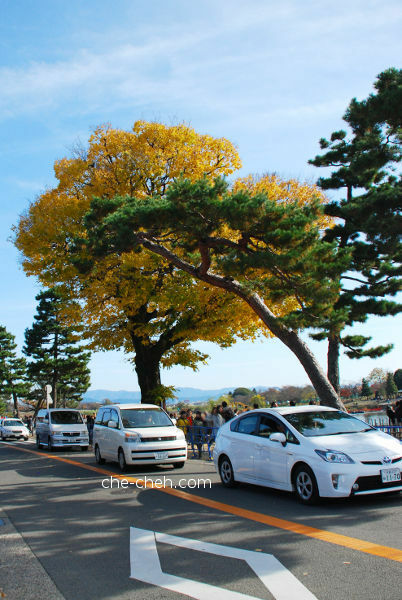 Love the colourful trees at Arashiyama! Nature is a great artist! Wow! 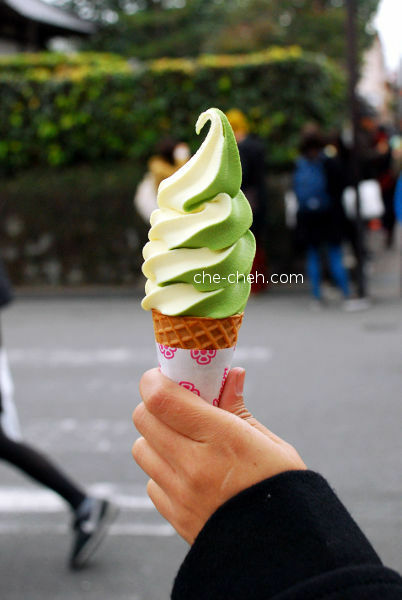 Drooling at the matcha tofu soft serve ice cream!